Brandon Santini is undeniably a worthy player to keep an eye on as the latest surge of young blues artists leave their footprint in blues history. His name is worthy of conversations that include James Cotton, Kim Wilson, Dennis Gruenling, Charlie Musselwhite and other frontline harmonica players. 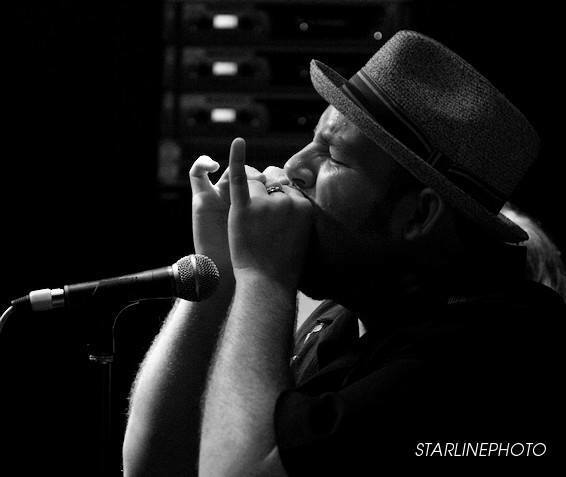 Brandon combines his love and respect for traditional blues with a present, colorful style of playing that is often compared to James Cotton or Paul Butterfield. He founded the Blues Music Award nominated band Delta Highway in 2003 and relocated to Memphis where he absorbed the sounds and culture of the Delta and North Mississippi Hill Country, honing his craft night after night, sweating it out in local Beale Street clubs just like Robert Johnson, Muddy Waters, and B.B. King did decades before him.Live & Extended! is Brandon’s third album, released in January 2015 by VizzTone Label Group. Recorded at Quebec’s upscale concert venue, le Petit Impérial, the packed house responded quickly as Brandon Santini and his tight touring band hit the stage with all the raw blues power and impact of the 1970s-era Paul Butterfield or James Cotton Blues Band. No wonder the album was nominated for a 2015 Blues Blast Award. Brandon’s A-Team road band includes Timo Arthur on guitar and backing vocals, Nick Hern on bass and backing and Chad Wirl on drums. Book Brandon and band and experience a show like no other.